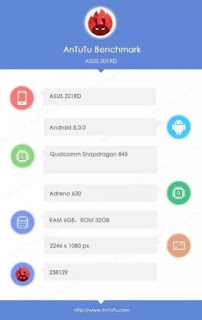 As I discuss in last post Asus is working on zenfone 5 and 5 lite phone.We seen alleged zenfone 5 live live pictures in previous update.Now the new update is that Asus may launch their flagship phone along with zenfone 5.As per new leaks,the device model no is Asus Z01RD,which is confirmed by Antuntu. 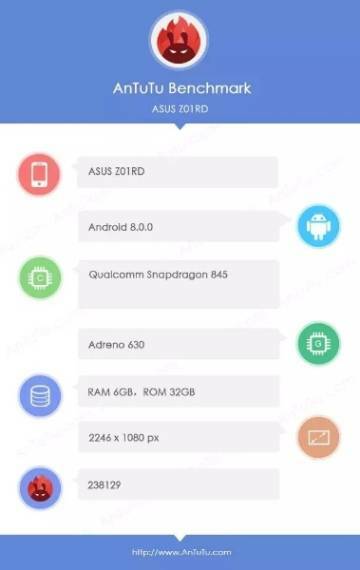 When it comes to features of phone,it will come with 845 snapdragon processor and Adreno 630 GPU.It is expected to come with 8GB RAM and 32 GB onboard memory.Pre installed os will be Android Oreo 8 and would be upgradable to 8.1 Android version.Display will be featured by FHD plus resolution with 18:9 aspect ratio,according to information. 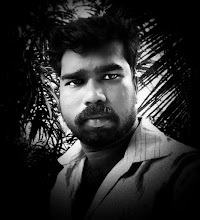 However,the phone is expected to launch in MWC with zenfone 5 and 5lite.The other expected features of this phone are,a dual camera setup on rear which is a combination of two 12 MP sensor and single 20 MP selfie snapper.It also expected cone with a massive battery which is about 4000 mah.